Leonardo da Vinci advised observing soiled spots on walls that could represent "strange faces". This is precisely what facial recognition specialists are asking of machines today. Evidence through images can be found at the Ars Electronica Center in Linz where members of the Korean duo Shinseungback Kimyonghun have assembled a few faces recognized by algorithms scrutinizing clouds. The most surprising is that we humans are also seeing some possible incarnations. At the request of the festival organizers, these same artists have exhibited other faces at the mall that you'd think were concealed by a thick mist. But the reality is quite different as these are the collected portraits of all the film actors. 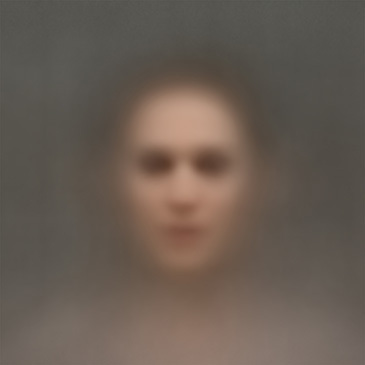 The machine in this case automatically collected faces of a feature length film in order to merge them in a blur evoking that obtained by Gerhard Richter in a more analogous way. As for the obsession of the two Korean artists for faces, it is confirmed by visiting their website where you can discover the video sequence of a mirror that turns away from faces. Ei Wada is a regular at the festival. 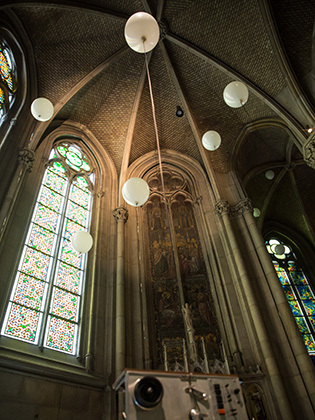 This year he is presenting an installation in one of the chapels adjoining the choir of the Cathedral of Linz. It's called "Flying Records" and consists of six tape recorders demonstrating high fidelity analogue sounds of yesteryear. But their mechanisms have been somewhat enhanced by digital components dedicated to controlling the elevation of six helium-filled balloons that retain the tapes. The idea behind this work is relatively simple. The balloons "stretch" sounds up while the recorders rewind them downwards. The clatter of tape punctuating the sounds of the artist's voice, recorded on each band, are part of an entirely ethereal music of comings and goings. It seems to escape gravity, just like the gas contained in the balloons. The audience is silent as they listen to this music with sacred overtones in a place that is equally sacred. As for the elevation that this sound installation symbolizes presented in such a context, it is a continuation of the theme of the ascension in Western art history from Giotto to El Greco. The Golden Nica for Interactive Art was awarded this year to Paolo Cirio for his project that can be seen at the address loophole4all.com. It is the same place where the names of 200,000 shell companies are communicated from data extirpated by the artist from a government server of the Cayman Islands. 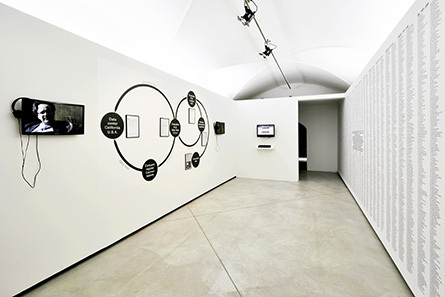 In the space of the Cyberart exhibition, as for the project site, which places itself at the intersection of conceptual art, investigative journalism and the world of business, it issues certificates dedicated to usurping the identities of offshore companies. It is a provocation aimed at denouncing tax evasion, usually reserved for the powerful and recommended by well-informed experts, by making it democratic. And it is for the spectators at the Offenes Kulturhaus to use, by carefully choosing the names of companies they could hack in turn to no longer pay taxes. Paolo Cirio, meanwhile, admits to having been pressured to remove the names of the companies who do not appreciate this digital practice of contemporary art in the least. Using the methods and codes of the company in an artistic context, Cirio reveals what is usually not accessible to us. And yet today, there are very few multinationals that do not have a subsidiary in the Cayman Islands. The robotics piece by Jacob Tonski, who was also awarded a distinction in Interactive Art, is entitled "Balance From Within." 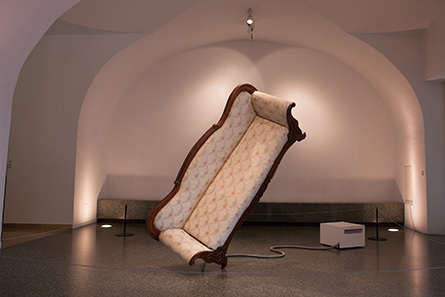 It comes in the form of a sofa floating literally in the space of the Cyberart exhibition through the mechanism that holds it from inside, balancing on one foot. The furniture is Victorian and symbolizes, according to the artist, human relationships that exist between those who sit there. There are indeed a lot of decisions that have been taken in such circumstances, where the balance of relations is a matter of listening, effort and even concessions. Balance has always been one of the most universal values, in religion between the Yin and the Yang or right and wrong, in economy with expenditure and revenue, or in ethical or unacceptable practices. But back to the venue where the engine of the machine makes noise symbolising effort while spectators enhance the work with their comments by projecting their personal quests for balance. But will digital technologies, in this context a sofa in suspension, be likely to promote the balance of tensions between people as between states? The Golden Nica for Computer Animation was awarded this year to a sequence entitled "Walking City". Designed by Matt Pyke with a soundtrack by his brother, Simon Pyke, the universe of this work is extremely white. 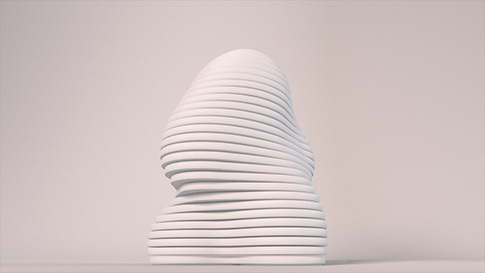 A character animated by Chris Perry of the Universal Everything studio, moves with determination to the rhythm of repetitive music that instantly draws us in. The subtitle of the piece, "Architecture + Evolution + Movement" provides some additional guidance. Architecture, as a tribute to the British architect Ron Herron from the Archigram Collective, who in 1964 initiated the concept of "Walking City" through an article he wrote. Evolution, because the materials composing the character moving rhythmically in the picture continue to hybridize from substructures to facade coverings or particles. Movement, because at no time do we imagine that this character can stop, so determined he seems in his walk. A walk that also evokes those who, equally determined, attract attention by moving to influence their / or our future. History is also being told with steps, towards cities or against states, at times solitary or collective. The Cyberart exhibition ends with a somewhat unexpected video sequence in such a context. It was made by Japanese artist and designer Daïto Manabe, one of the regulars of the festival, together with seven other creative collaborators or engineers. It is the reconstruction, using sound and light, of the fragment of a Formula 1 race driven by Ayrton Senna in 1989 on the Suzuka circuit. 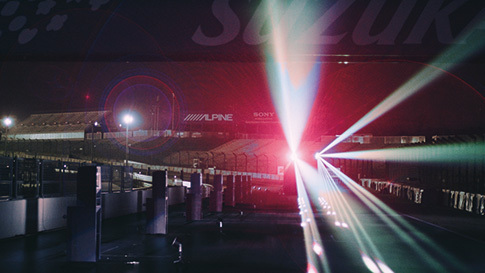 Data from the era having been preserved for this reconstruction entitled "Sound of Honda / Ayrton Senna in 1989," the performance is given at night and digital technologies controlling the simultaneous movement of light and sound throughout the circuit make the invisible, visible. There is no car, no driver and nothing is at stake, but the race is indeed held there. Extirpated from the past, the data from this race bring back the machine and the speed, which in terms of art summon up Italian Futurism. Sports, over time, has become a subject for many contemporary artists making use of both video and digital supports, like Philippe Parreno or Harun Farocki - who died last July - who also had a pronounced taste for reconstructions. Moving from one body of buildings to another, without however leaving the Offenes Kulturhaus, you enter the solo exhibition devoted to the sound artist Bill Fontana. 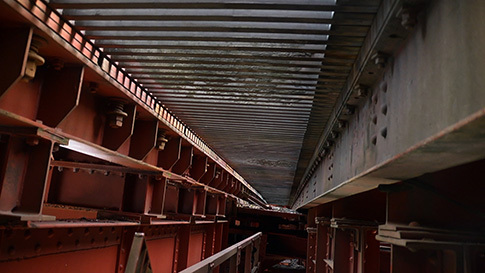 Breaking with the use as well as the appropriation of architectural monuments and other engineering feats, he has recently focused on San Francisco's iconic bridge. He placed a camera accompanied by a sound-capturing device in the deck of the Golden Gate Bridge in 2012 in order to extract a "sound vision". The shot is static, however, there are many audio-visual events that punctuate the image. Among those we notice are the shadows and subsequent clacking of vehicles using the bridge to cross the bay. Not to mention the sombre and distant sounds of foghorns and their obvious musicality. These same events, whether they are contained in the image or come from somewhere else, live together in this "Acoustic Vision of the Golden Gate Bridge." All of it, simply because of its repetitiveness, participates in keeping the audience in a state of waiting with no real suspense. The tension inherent in the non-mobile frame seems to be "softened" by a multitude of micro-events. Finally, there is the Höhenrausch exhibition where notably one finds the robotic installation "Ninety Six" by Nils Völker. 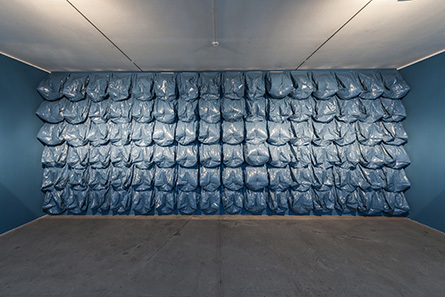 The title tells us little about the nature of the work but still shows us the number of its components or modules: uniformly blue grey plastic bags usually used for holding household waste. They fully cover the back wall of the work's environment. Alternately, they inflate and deflate making waves that give an organic feel to the area of ​​this piece of the Offenes Kulturhaus. We are not facing a work, but see it from the inside of the body that it is. Unconsciously, we adapt our breath to the rhythm of these artificial breaths, to the point that we are one with the work. Final note, this Berlin artist has been nominated for the Cube Prize, whose upcoming exhibition will be at the Espace Saint-Sauveur in Issy-les-Moulineaux, in the Ile de France. Written by Dominique Moulon for MCD and translated by Geoffrey Finch, September 2014.